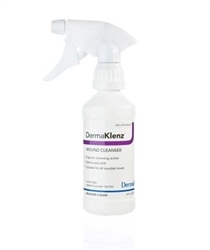 DermaKlenze spray is a gentle and mild wound cleanser with zinc suitable for all exudate levels. It contains no detergents and It requires no rinsing. DermaKlenze comes with an adjustable spray bottle that creates direct stream or gentle mist with appropriate psi which facilitates the removal of organic material, slough, blood clots, or other wound debris.